“Lydia was sick yesterday. Louisa’s now the one not feeling quite herself. But, it’s moments like this that stop me in my tracks. 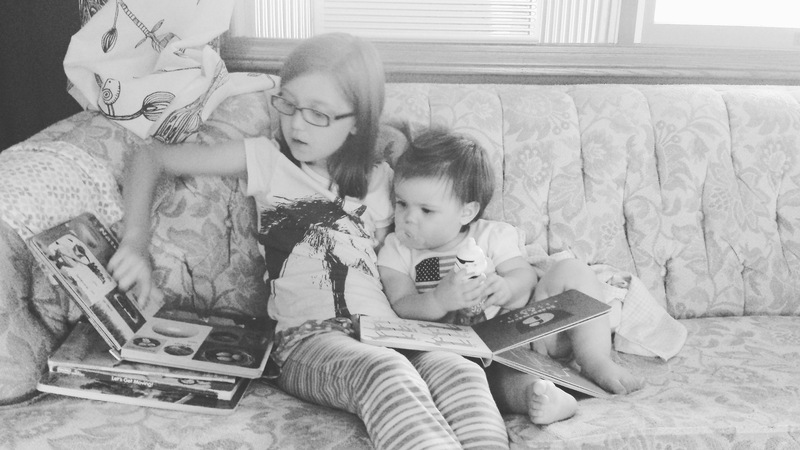 When I ask Lydia to sit and read to her sister while I quickly throw a load of laundry into the dryer (gotta get at those germs! ), and I come out and see this: it stops me in my tracks! I felt led this evening to share this to a more broad audience than Instagram, so here I am, bearing the past of my heartaches with you all. Having a second child, after our daughter Lydia, has been an extremely painful and drawn out journey for my husband, Luke, and I. Neither one us could have ever even fathomed the roller coaster of events that would come from the desire to have a sibling for our daughter. We have walked hand in hand through a very dark season of loss. It began with one miscarriage, followed by five more over the course of almost six years, before we had our second daughter, Louisa, in 2015. During that time we also reached out to other options, by becoming certified foster parents as well as stepping into a private adoption, both of which ended in ways that you would expect to read in a dramatic novel. As I’m reading the previous paragraph, I’m sitting here thinking: “Man, people must have thought we were nuts to put ourselves through all that.” All I can say is that it didn’t feel that way in the moment. All of these events took place individually, during our journey of hope that we somehow would be able to grow our family. My husband and I found ourselves in this place of noticing all the hurt and heartache around us. Every person on this planet suffers from heartache. We didn’t want to keep getting stuck with begging God to tell us why people go through hardship. We wanted, instead, for our eyes to see how God could help them, help us to get through it. So, that’s some of my heartaches in a nutshell, and I know you too have so many you could share with me as well. I’m not going to even remotely pretend to have all the right words to say, and to always be confident in this life journey. I do know, however, that God is good. He remains the same from now unto eternity. He sees our heartache. He loves us. He is willing to walk with us through whatever comes our way. When the prayers are answered, and when they are not. God is the “how” that brings us through. Thank you so very much for your heartbreaking yet inspiring story. Yes, God is the “how” we get through life. He journeys with us, sustaining us and picking us up, thank you Lord for your faithfulness. Beautiful… Had me in tears. Our God is faithful very encouraging blog! I have had three miscarriages and now I’m battling breast cancer. It’s a good quote. Never once have I questioned His goodness or been mad. He didn’t give me this. He gets me through this. Thank you for sharing! Wow, thank you for sharing. So thankful God carries us through. I will pray for you as you fight this cancer! So love this post. Thank you for sharing your heartache and your message of hope. God is the only One who can carry us through those dark moments and seasons when we desperately search for the answer to our “Why?” I love your husband’s conclusion and decision to ask rather, “How…?” When I had my miscarriage, after 13mos of trying, I had to learn this as well. He did bring me through, and we now have 2 handsome, albeit rambunctious, boys! ❤ Praying that your girls are better and that they will always have a strong bond of friendship as they do in this picture. So precious. PS. Also, praying for your complete healing, C.
C, first of all, let me so how sorry I am for not responding to you sooner. I was not on my blog throughout the holiday season. Beautiful post and beautiful girls. God is always with us, often we just need to remember this truth. You said this very eloquently. Thank you so much, Joanna. Very appreciative of your feedback. Blessings.